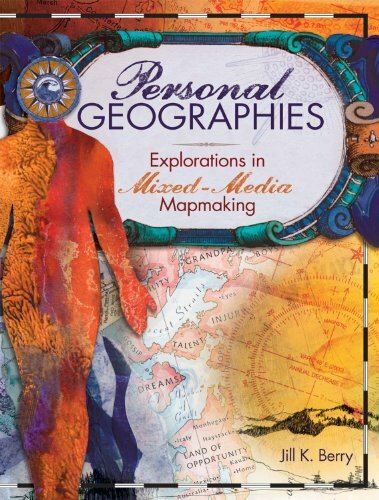 Personal Geographies is a fun 144-page book by Jill K. Berry that is full of inspiration and instruction. In this book you'll learn to make mixed media maps that explore both your inner world and your outer experiences, and the crossroads between the two. In this review I'll explain more about what you'll find in this book, show you several sample pages, and tell you where you can download a free lesson from the book! Personal Geographies is full of wonder, whimsy and inspiration, offering readers ample opportunities for introspection and creative expression. This beautifully-illustrated book features 21 mixed-media map projects involving lots of different techniques, from stamp carving to collage to inking with a stencil brush, and more. You'll learn how to use translucent vellum to create layers of depth and how to create a reliquary that opens to reveal hidden treasures. This is a book of self-exploration through art. Your main inspiration is yourself - you are instructed to look within, to ponder who you are and how you got there, who and what shaped you over the years, and reflect on the path ahead. Each project is highly personal as you chart your inner world and honor your physical journeys as well. Personal Geographies helps you "embark on a grand journey of self-discovery through mapmaking" where you "create artful maps of your self, your experiences and your personal journey". Author Jill K. Berry is a true cartophile (someone who loves maps). In the Intro, she tells us why she loves maps and the meaning that maps have held throughout her life. She explains how maps don't have to represent actual reality. No prior mapmaking experience is required to create maps that are both visually appealing and meaningful. She has taught a mixed-media mapmaking class for several years, and explains that "maps make known our relationship to the world at large". They are "a tool for storytelling and self-discovery". The Intro sets the stage for the lessons in the book by demonstrating and explaining what a map can be (with quotes from 6 authors who wrote books about maps). A map is not just a utilitarian tool that you consult to find your way from Point A to Point B - rather it can be a meaningful tool for self-exploration and result in a highly-personal work of art that reflects your inner and outer journeys. To help spark your creativity and set your mind towards the possibilities of mapmaking, Jill Berry lists "Questions for the Cosmic Cartographer" - to help you define and envision your map, as well as "Things to Map" - a list of ideas and possibilities to spark your creative flow. Jill K. Berry rounds out the Intro with sections detailing the "Parts of a Map" with examples and descriptions, such as a cartouche, compass rose, legend, neatlines, etc. This familiarizes you with some of the recurring symbols you'll be using throughout the book to help your maps take shape. There are pages devoted to "Designing a Compass Rose" and "Designing a Cartouche" - two important elements in traditional mapmaking that you can alter to suit your creative needs. Finally, a list of recommended art rounds out the Introduction, getting you ready to dive into the lessons. Each lesson starts with a brief explanation describing the project and a list of materials. The finished artwork is shown at the beginning of each lesson to demonstrate what you are aiming for, although your own piece may look very different and that's okay, since these projects rely so much on your personal experiences and preferences. Since these lessons and the resulting artwork are highly personal, Berry explains what the maps she made for each lesson symbolize to her. This helps you see the possibilities when creating your own maps. 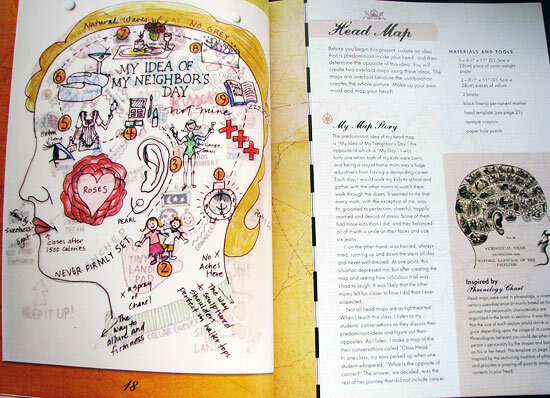 Some of the lessons are inspired by or resemble other art forms: such as phrenology, palmistry, cordiform, pantins, and more, and in each case there is a box of explanation and an example image showing from where Berry derived her inspiration for creating the lesson. Personal Geographies explores making: "maps of your physical self, maps of your experiences, and dimensional projects with a cartographic theme". The book is divided into 3 chapters that explore these concepts through multiple projects. The first chapter revolves around inner exploration and discovery, setting you on a course of personal enrichment where you examine familiar and unfamiliar aspects of yourself. Jill K. Berry describes the lessons in Chapter 1 as "stretching exercises - artistic yoga - to help sort out and celebrate the maze that is inside of you and to introduce the art of mapmaking as a tool of self-discovery." Chapter 1 ends with "More maps of the self" showing examples of artists' maps involving the head, hand, heart and body, created by various artists, along with their explanations of the work. These maps are similar in theme to the lessons, but with each artist's own unique twist. The second chapter invites you to explore your relationship to the world around you - "memories, vacations, the expanse of time and the here and now". These lessons help you gain a sense of perspective about your life and the events that have shaped who you are. Chapter 2 ends with "More maps of experience", featuring several inspiring maps by various artists that reflect on similar themes as presented in the previous lessons. Many projects in Chapter 3 involve the use of maps, postcards, travel ephemera to create fun 3-D projects, such as a Postcard Journal, a Cartographic Reliquary, and an Unfolding Maze of the Future. Personal Geographies is one of the most beautiful and inspiring art instruction books I've ever seen. This is more than just a typical "how to" book - it's an invitation to look within and process your thoughts, feelings, journeys and life experiences. The lessons ensure that making art is an enriching process on many levels, especially since the emphasis is to create art that reflects you and your unique experiences, rather than to create art that is designed to impress other people. Some of the techniques in this book may be too advanced for beginners, but even those with no previous art background can still be inspired by the concepts. The lessons can be adapted to suit your needs - for instance, you can use the art supplies you have available instead of using the exact materials she suggests, or you can adjust the concept of the lessons to better convey a certain topic or angle that interests you. Personal Geographies is an excellent resource for anyone who would like to combine art-making with inner reflection. The mixed media approach welcomes artists of all skill levels, although certain lessons may be somewhat difficult for total beginners who are working without guidance. In that case, beginners may substitute certain materials and processes for those that are more familiar to them, and still benefit from the concepts behind each lesson. Personal Geographies is especially enticing for people who love maps and traveling, and those who have a collection of ephemera from throughout their lives that they would like to turn into art. This book will be beneficial to teachers looking for creative lessons that spark introspection, providing opportunities for their students to reflect on their lives and experiences. In Personal Geographies, concept and process are more important than the outcome, so anyone seeking a creative spark can dive into this book and try out the lessons without worrying about creating a "perfect" piece of art, since each resulting artwork would be unique and meaningful in itself. Click here for a free 7-page bonus lesson from Personal Geographies, courtesy of North Light Books! The lesson will open in a new tab or window in PDF format. This book is driven by the concepts of each lesson, rather than focused on teaching mixed media techniques. Therefore, this is not the right book for people who are seeking in-depth instruction about specific mixed media techniques. As mentioned earlier, beginners may struggle with certain technical aspects in some of the lessons, but with a little creativity they can adapt the lessons to suit their skill level, by using the concept of the lesson as inspiration. If you make a purchase after clicking on any of these links to Amazon or Book Depository, I'll receive a small percentage of the sale, which helps support this site and keep it ad-free! You can find Personal Geographies at Amazon, where it's eligible for Amazon Prime or Free Super Saver Shipping. Click here to see Personal Geographies on Amazon. For non-US customers, you can buy Personal Geographies from Book Depository which offers free shipping to almost anywhere in the world. Click here to see this book on Book Depository. A complimentary copy of Personal Geographies was provided to me by North Light Books for this review, which is based on my honest assessment of the book. All images in this review are displayed with permission and are copyrighted by their respective owners.